Since we talked about rebuilt transmissions, let’s go back and talk about the need for a transmission flush. No, we are not trying to sell you on the service, even though you could need it without realizing that you have to take the car into the shop. When do you need to get a transmission flush? Well, you should get one every two years or 30,000 miles, whichever comes first. But there are times when you have to get a flush done sooner to protect the car as a whole. Here are some of the warning signs that it might be time to get that flush booked soon. Grinding? Sharp noises? When things sound really bad, it’s time to start checking the transmission fluid and also the color of the fluid. It should be bright red rather than black because of dirt build up. 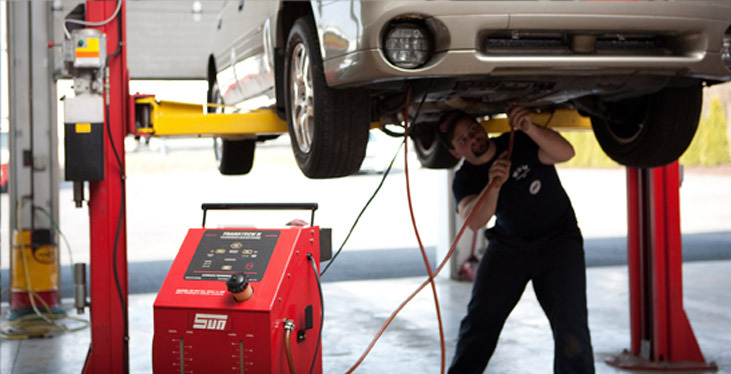 If the fluid level is at the right level, then you really need to get the transmission flushed. If you leave it alone too long, serious problems can occur. If you enjoy driving long distances, but find that you’re having trouble shifting gears, you could have transmission problems. Too much dirt is the primary reason why transmissions break down, but that doesn’t mean that you have to just deal with it. Flushing the system will bring things back in order fairly quickly. Is the transmission slipping? If the problem is low fluid that never seems to increase even when you add fluid, it could be because the fluid is being blocked by the sludge. Don’t let it get you down, of course: try that flush. It could solve the problem and let you get back on the road. A delayed vehicle means that it “stalls” a little before taking you where you want to go. This is almost certainly a sign you need to bring the car to the shop. If your car is surging forward all of the time, it’s most likely transmission fluid isn’t flowing properly. If the flow is jerky, then the movement of your vehicle will be jerky as well. See how important transmission fluid really is? Overall, there are a lot of little warning flags that go off with your car all the time, but sometimes we’re too terrible to really look at them. Make sure that you’re looking at all of this stuff in order to keep your car healthy and running smoothly on the road!